When my wife (who is not a tennis player) and I play tennis, we really have a good time. If you are a guy, try as much as you can to hit the ball back to your gal. Do not attempt to look macho. Hit the ball nicely to her, allowing her to enjoy playing tennis with you. Avoid at all costs to play points or anything that gets people competitive. Just bring a basket of balls and rally them back and forth over the net. 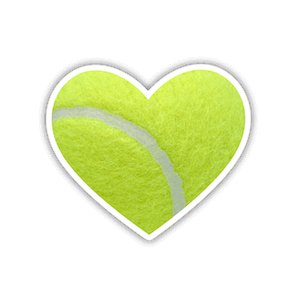 Take water breaks every 10 – 15 minutes and talk about the lovely weather and how fun it is playing tennis outdoors (or compliment the facility if you do it indoors). If you are a gal, just like the above advice, avoid playing any competitive games for today. Go out with your husband or boyfriend and rally some balls back and forth complimenting each other. If the guy feels the need to get too competitive or show off, let him do that; be patient, compliment and invite him to take a break if things heat up. If you do not have a partner, just go out to a tennis club, rent a ball machine and hit some balls. You never know, maybe you will meet someone who also needs a partner.